Amongst the records of WAM there has resided an occasional personnel file. 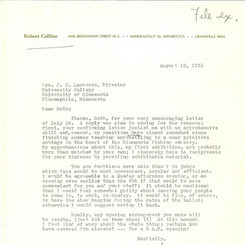 While all personal and confidential records have been confidentially recycled – general notices, correspondence, and position descriptions related to the Gallery were retained. 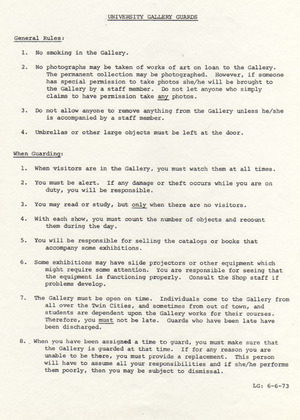 At left, directions and qualifications for gallery guards (University students) are articulated in an administrative document dated 1973. While the guard duties of today differ from those of nearly 40 years ago (guards are no longer responsible for the sale of catalogues, and smoking isn’t allowed in any public building in Minnesota), some core job duties remain the same – i.e. reinforcing the photography policy, as well as ensuring the security of artwork. 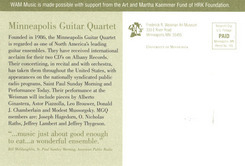 When the Frank Gehry designed Frederick R. Weisman Art Museum was built in 1993, a space was created not only for exhibition, education, and experiences with art, but also for another ‘e’ – events. 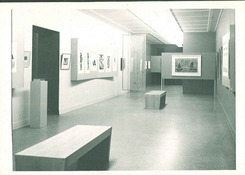 The space provided the museum the opportunity to stage seminars, lectures, symposiums, and concerts in conjunction with exhibitions and educational programming, as well as offer space rental for private events such as wedding receptions and holiday parties. 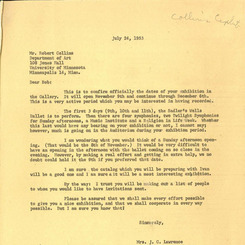 Private events records which contain such items as catering receipts, wedding reception schedules, diagrams of table and chair set up, etc., were considered incidental to the museum’s core activities, and thus not appropriate to the collection. The nature of the materials – credit card receipts and photocopies of personal checks – make it such that they cannot be kept without restrictions. These records were placed in confidential recycling. 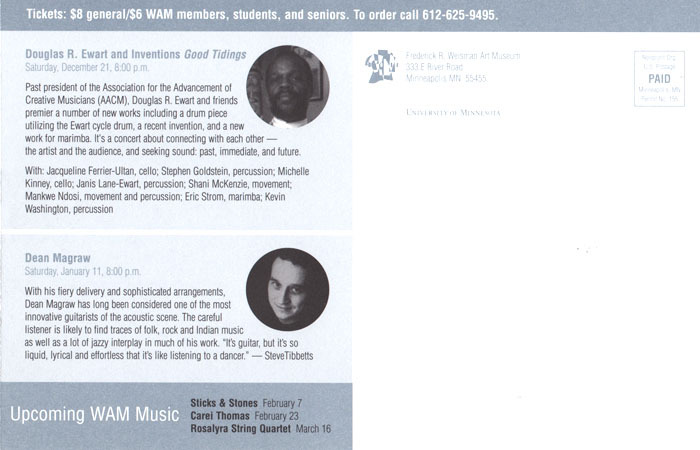 Music is still a part of WAM events programming. 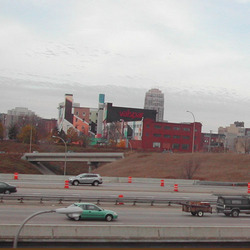 In the build up for the recent re-opening in October 2011, a music event was held not within the space – but on top of it. 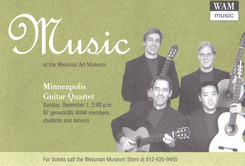 Local band The 4onthefloor played a lunch-hour concert on the roof of WAM which entertained students, staff, and University visitors who danced on the sidewalks and gazed up at the building while enjoying their lunches on the lawn in front of neighboring Coffman Memorial Union. 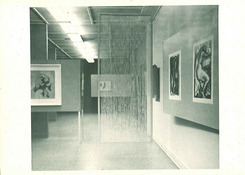 The audience questions also turned into personal recollections shared by those that had experienced WAM as it was known previously – as the University Art Museum and University Gallery. Throughout this project we have been introduced to the processes of the archives and have been given the opportunity to teach ourselves, and to share with others, the love of art, history, and the University. When we first started adding folders to boxes, rows to a spreadsheet, and posts to the blog, I could have never imagined that one day we would be standing in front of a crowded room, sharing the stories that we uncovered with an audience that is just as intrigued and enthusiastic about those stories as we are. 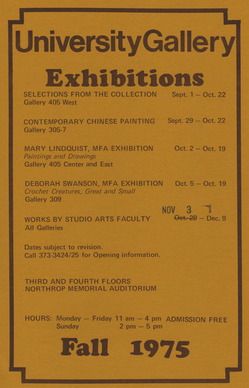 Found: A poster announcing fall exhibitions at the University Gallery, 1975. 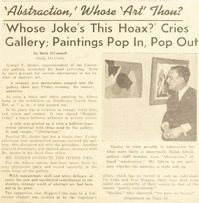 There’s one too many paintings in the abstract art exhibit in Northrop auditorium, and how it got there or what to think of it is baffling the campus…. It’s title is “Distraction,” and it is signed by Heggen-Cohn…. 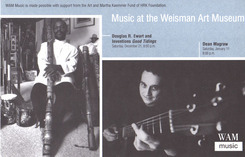 Two fellows by the names of Vic Cohn and Tom Heggen are registered at the university. But they can’t be guilty. Neither owns a beret. 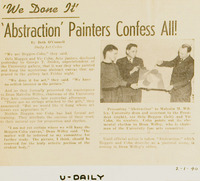 In a Minnesota Daily article from February 1st, juniors Vic Cohn and Orlo Heggen are revealed as the perpetrators, saying, “We done it for the art.” In a Star Tribune story that same day, they confessed to owning a beret, but claimed neither had ever worn it in public. 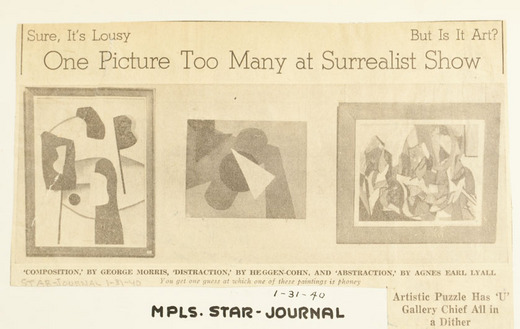 Cohn and Heggen gifted Distraction to University of Minnesota Dean Malcolm Willey, stating, “We would like to have it hung where art lovers will appreciate it.” I wonder whatever became of Distraction? When not processing, researching, or blogging about the WAM archival collection, I try to take some time to visit other museums – which I did this afternoon to view the Walker Art Center’s new exhibit, Graphic Design: Now in Production. The exhibit features the vast changes in design over the course of the past ten years. 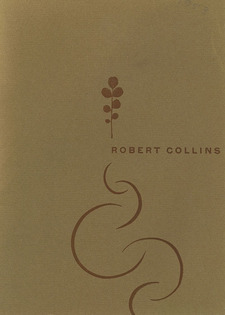 After my visit, my attention again returned to the WAM Files only to find that 58 years ago on this very day, November 5, 1953, a display of graphic designs and other works by Robert Collins, then assistant professor of design at the University, opened at the University Gallery. After viewing the complexities and intricacies of designing of the past ten years this morning, encountering Collins’ 1953 exhibit and simple statement this afternoon – is simply appreciated.